Last night, Douglas Kamerow and I debated Megan McArdle and Scott Gottlieb at Intelligence Squared over the notion, “Obamacare is now beyond rescue.” Intelligence Squared picked the topic two months ago, when the website was still broken, insurers were frantic, congressional Democrats were in a full-scale panic, and it seemed genuinely possible to many people that the law would simply fail. The arguments McArdle and Gottlieb made last night bore little resemblance to the sorts of failure predictions that were widely circulating last November. Many of their arguments simply took issue with the law’s goals; they argued that Medicaid does not make people healthier, that healthy people ought to be able to enjoy the financial benefits of being skimmed out of the insurance pool, and that politicians will reverse all the mechanisms needed to finance the law. In other words, they argued that the law was doomed for the reasons opponents had argued it was doomed in 2010, or for reasons a conservative could offer to suggest Medicare and Social Security are also doomed. Today, the website is working (though still not flawlessly). News stories recently emphasized that the exchanges have attracted disproportionately older customers to date, but that is expected. 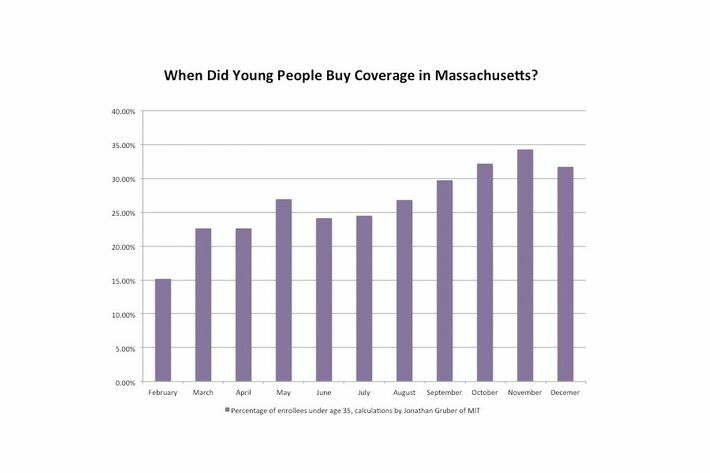 The website failure in October and November compressed the rollout time, and the age composition of the exchanges is following the same pattern as Massachusetts — older people enrolling first, and then the proportion of younger customers steadily rising. The enrollment surge from December is continuing. Sarah Kliff reports that once-panicky insurers are now expressing satisfaction with the customers they’re enrolling. And even if none of the optimistic projections are borne out — even if, unlike Massachusetts, the age distribution of the exchanges freezes into place — a death spiral still will not occur. The Kaiser Family Foundation crunched the numbers and found that even this worst-case scenario would result in a 2.4 percent premium hike. That’s a trivial increase, nothing like the kind of premium hike that would chase healthy customers away and trigger a death spiral. The website botch may mean that the exchanges enroll fewer customers for 2014 than originally hoped. But the effect on the long-term prognosis of the law turns out to be essentially nil. With the grand threats of a massive technical failure and an actuarial death spiral dispatched, what remains? In the feverish autumn panic, Democrats in Congress appeared ready to stampede away from Obamacare. The Hill panic peaked out with the Upton bill, a Republican proposal that would have genuinely impaired the functioning of the law, and which attracted nowhere near enough support to override an Obama veto. The failure of the Upton bill marked the end of any nascent legislative threat to Obamacare while Obama still holds office. Meanwhile, a newer legislative challenge has lurked on the sidelines. Conservative legal activists had seized on a quirk in the legislative text of the law which, if taken out of context, could be read to deny tax credits to any customers in the exchanges run by the federal government rather than the states. Yesterday, a judge laughed this challenge out of court. 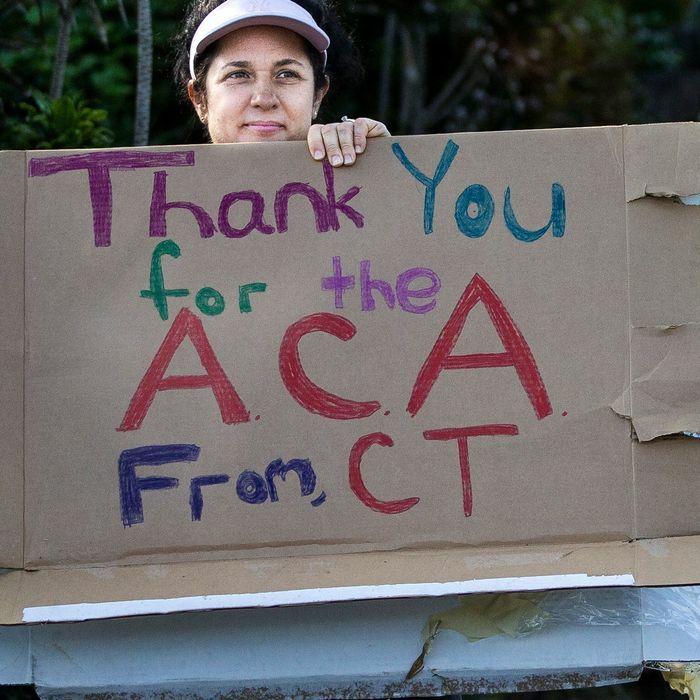 The point I tried to make in last night’s debate — with limited success, at least as judged by the voting audience — was that Obamacare opponents had merely fallen back on their original, ideologically driven opposition to the law. To call their opposition ideologically driven is not to say it is wrong. It is merely to say that they philosophically oppose the goal of national health insurance. They have persuaded themselves the law can’t accomplish its goals, when their real fear is that it will. There will be no glorious triumph of Obamacare, no cinematic score playing in the background, and no concession of defeat by the law’s opponents. That’s not how politics and public policy work. In my opening remarks, I compared Obamacare’s progress to renovating a house. It’s a frustrating process with fits and starts, disappointments, and constant frustrations. Obamacare opponents have tried to paint the frustrations as a collapse in progress — every time an electrician fails to show up or a part is unavailable or a design plan has to be reijiggered, they use it as proof that the whole thing is going to collapse. But it was never going to collapse, because renovating a house, like having a national health-care system, is something that is fundamentally doable. Obamacare opponents are going to have to let go of their hopes that the law cannot work and face up to their honest belief that they don’t want it to.